Hydrogen gas is considered to be a promising "green" fuel. Hydrogen is the lightest chemical element, and is an efficient energy store and could possibly replace gasoline in vehicles. However, this element does not exist in large amounts in nature, and should be generated artificially. Hydrogen can be generated by splitting water (H2O) into hydrogen (H2) and oxygen (O2). There are different ways to do this, but among the cleanest - hence most attractive - is employing solar cells. These devices capture the energy from sunlight in order to drive the water-splitting reaction. Sunlight comes in a spectrum of colors, each having a different wavelength. Solar cells should absorb light of specific wavelengths, depending on how much energy the cell required to drive the reaction. The more of the spectrum it absorbs, the more hydrogen it generates. Unfortunately, most cells absorb only shorter wavelengths of light, in proportion to the higher energy region of visible light below the red light domain. This indicates that when colors such as green and blue light can be used, the rest is wasted. Now, researchers from Kyushu University in Japan and its Institute for Carbon-Neutral Energy Research (I2CNER) have possibly solved this problem. They created a device operated by near-infrared (NIR) light, the part of the spectrum which is invisible to the naked eye, with longer wavelengths compared to visible red light. Thus, they allowed a wider spectrum of light, including visible, NIR and UV, to be produced. Their design cleverly uses the chemistry of ruthenium, a heavy metal related to iron. The researchers’ achievement was reported in the journal Angewandte Chemie International Edition. Specific metal-organic hybrid materials are useful for capturing light, which helps their electrons to "jump" into orbitals in the organic parts of the materials connected to the metal center. This is the first step in generating hydrogen in solar cells, because electrons are the drivers of chemistry. The jump between orbitals, however, is usually so big that only UV and the higher energy region of visible light have sufficient energy to stimulate it. NIR, red, and even longer IR light are simply reflected back or pass through the devices, and their energy remains unused. The design of Kyushu is different. "We introduced new electron orbitals into the ruthenium atoms," study corresponding author Professor Ken Sakai explains. "It's like adding rungs to a ladder - now the electrons in ruthenium don't have so far to jump, so they can use lower energies of light such as red and NIR. 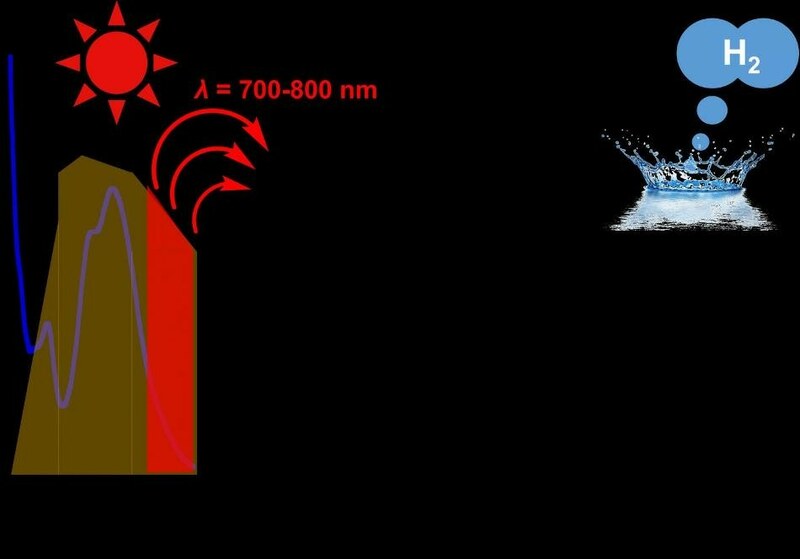 This nearly doubles the amount of sunlight photons we can harvest." The trick is to employ an organic compound - hexagonal rings of nitrogen and carbon - to connect three metal atoms into a single molecule. Actually, this not only produces new "rungs" - hence the ability to employ NIR and red light - but also makes the reaction highly efficient because of spatial expansion of the light harvesting part of the molecule. This accelerates the production of hydrogen. It's taken decades of efforts worldwide, but we've finally managed to drive water reduction to evolve H2 using NIR. We hope this is just the beginning - the more we understand the chemistry, the better we can design devices to make clean, hydrogen-based energy storage a commercial reality.